VIDEO : Snow Kiting awesomeness! Is Awesomeness even a word?! It should be and in the oxford dictionary they should simply put the link to this video!! Cheers Marty for sharing this on FB. Check out this awesome video. It took me a while to find where the bar was but it shows at the end. Looks like this poor chap has binned the safety and the bar has got caught on the post pulling it into this loop. It’s a long video so FF maybe your friend. For those people curious as to why it didn’t snap a line sooner, and for those people that want to learn more about looping kites safely this is whats happening. When the kite is looping for the first 19 off minutes, notice how the kite isn’t actually flying anywhere, its looping inside its own length so it’s not generating any apparent wind and is pretty much stalling itself, then all of a sudden towards the end it starts opening up its turn and really starts whipping a good loop, that is where the power of the kite loop is being generated! A few mins of that and something had to give and sure enough a line snaps ending the almost comical 20mins of looping and probably saving the kite. anyway, here is the vid..
For most of us in WA, it’s been since about Easter that anyone’s had a kite. I must say, moving over I didn’t realise how infrequently there’d be any any kiteable wind through the winter season. You’d usually be expecting the sea breezes to start trickling back by about mid-September but no sign of that happening yet. But we do have a winter weather system moving through from tonight that will push some wind and some very big swell our way over the next three or four days. I’d be guessing that down south, we’re going to see some of the biggest waves of the season, if not for a few years. 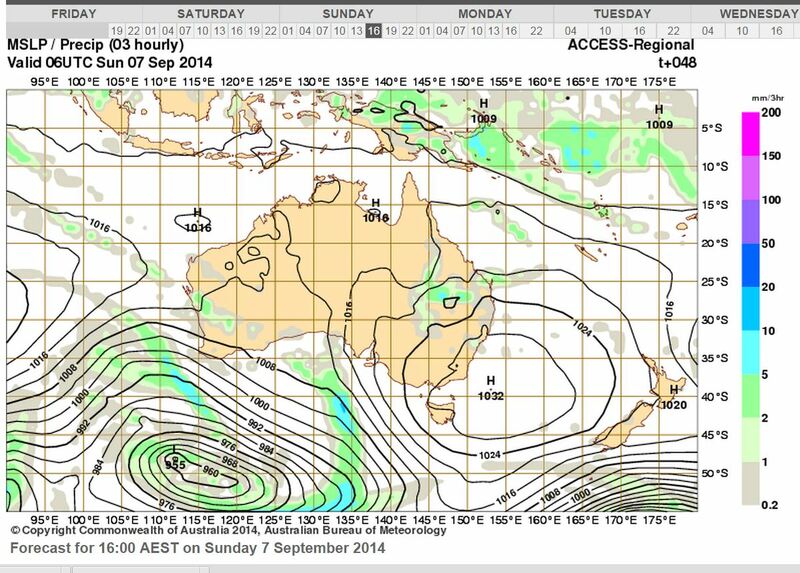 Tonight there’s a 970hp low pressure system sitting about 1,000km SW of Margaret River and moving SE. By tomorrow, it’ll strengthen to around 965hp and by Sunday to about 955. That’s a seriously powerful storm. 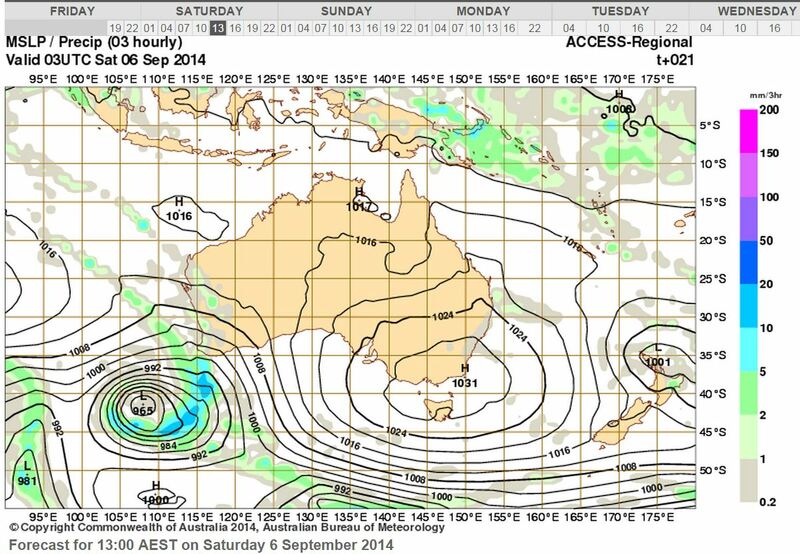 Anyone in a vessel at sea in those sorts of conditions is going to be in for a serious fight. 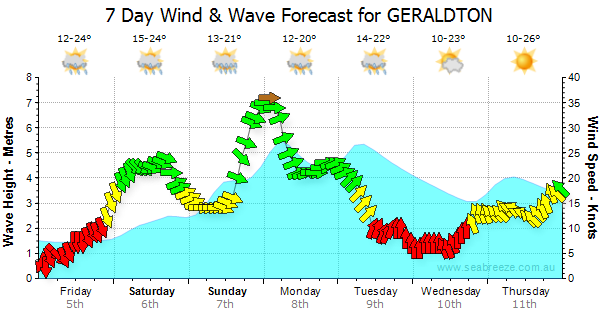 For those of us in the Mid West, that means we’ll get some rain tomorrow, swell up to 6m and winds from the West around 25 knots. By Sunday afternoon, it goes all pear-shaped with lots more rain moving in and continuing big swell and 35-45+ knot Westerlies. So, if you are up to the task, and have a decently small kite, tomorrow afternoon looks like the best time for a shot at it. But do expect to get rained on at times. Rain and swell continuing til about late Tuesday and the wind trailling off to about 20 knots on Monday and next to nothing by Tuesday. The swell finally fades by mid-Wednesday, along with the bad weather. Might be worth looking at in a few instances but do take care. You do recall the tragedies that happened last year round this time. Let’s not repeat those. Just look at it! it’s another replay of last week almost! Last week (bar the blue-bottle stings) was awesome, I had a day off and got some of the best waves in ages at Longy / Dee Why. Then the surf jacked up, cleaned up and gave Sydney some of the best surfing conditions we’ve had in ages. Swell was still around today but smaller with a nice 4-5ft at DY point and light winds keeping it super clean. 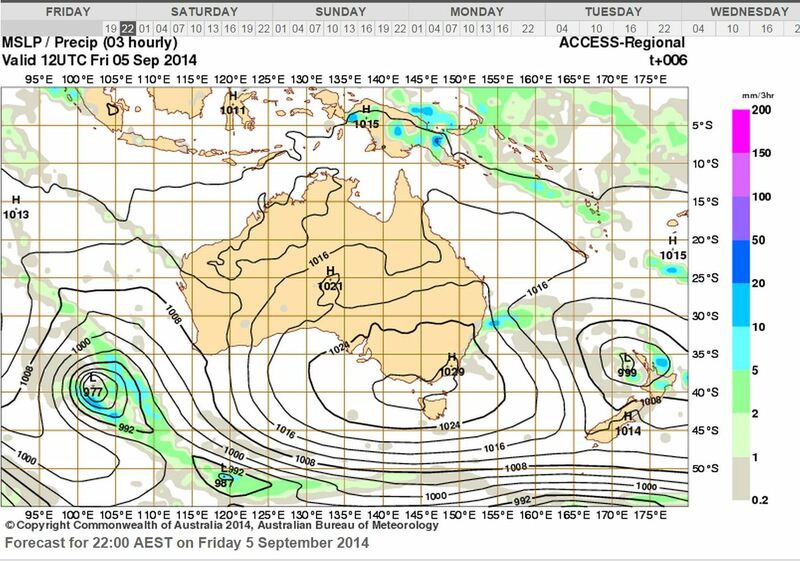 Now, this week looks like a repeat, as long as we’re not looking at too much west then it’s going to be a cracker! BIG surf forecast so if you aren’t up-to scratch then maybe hit the bays and harbours for safety until it backs down a bit. I’ll be hitting the surf if I can early in the mornings before work. IF ANYONE HAS A JETSKI AND WANTS TO COME GET SOME SICK WAVES AND FOOTAGE LET ME KNOW ASAP! !